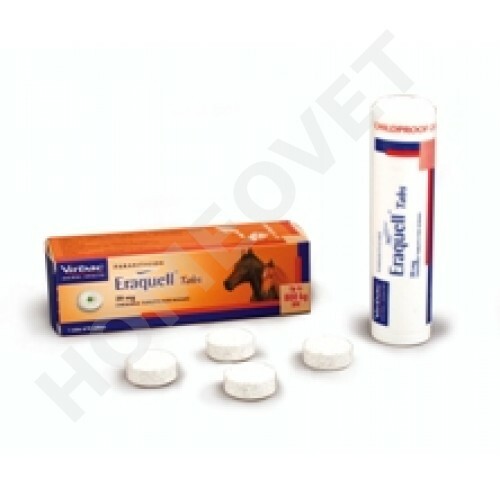 Do not use in horses known to be hypersensitive to the active ingredient or any of the other ingredients.Colic, diarrhoea and anorexia have been reported in very rare occasions post treatment, in particular when there is heavy worm burden. In very rare occasions, allergic reactions such as hypersalivation, lingual oedema, urticaria, tachycardia, congested mucus membranes, and subcutaneous oedema have been reported following treatment with the product. Ivermectins may not be well tolerated in non target species. Cases of intolerance are reported in dogs, especially Collies, Old English Sheepdogs and related breeds or crosses, and also in turtles and tortoises. This veterinary medicinal product does not require any special storage condition. Do not use after the expiry date stated on the box. Once opened, use the product within 12 months. Single oral administration.200 µg of ivermectin per kg of bodyweight corresponding to 1 tablet per 100 kg bodyweight. To ensure a correct dosage, bodyweight should be determined as accurately as possible. Once the correct dose has been determined, it should be administered in the following way : Present the tablet in the palm of your hand. Presenting one tablet at a time makes it easier for the horse to accept it, however the administration of multiple tablets at once is also possible. Repeat this gesture until the complete dose has been administered. During the initial administration, the tablet can be combined with a small amount of food or a treat to increase the acceptance by the horse. Store cool! Keep out of the reach and sight of children.